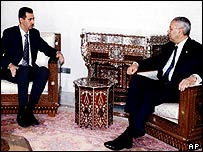 In May 2008, both Israel under Ehud Olmert and Syria under Bashar al-Assad acknowledged they were holding indirect talks to reach a comprehensive peace agreement. The talks were suspended seven months later. Yes, the Syrian civil war is in progress. It will continue and expand. The regime is down but now out. Much blood will be shed in Syria. If political agreement were not reached, Syria would fragment. The regime and its people would decamp to the Alawite Mountains and hold on to the cities along the coastal plain and maybe other places. An Alawite state, canton or the like could emerge. From there on, God knows what! The 1982 crackdown on Hama and events preceding it alarmed Hafez al-Assad. He was afraid he wouldn’t come out on top. He opened a main branch for the Syrian Central Bank in the Alawite region, where he also built universities and vital infrastructures. He wanted the area all set in case he needed to relocate there. At the time, he transferred all the Central Bank’s foreign currency reserves to the (regional) branch. What can prevent this, or something similar, happening today? I know the Syrian regime well. I was in contact with the late president and then with his son, the current president. We worked together on peace with Israel. Some 7,000 people have been killed in Syria so far. Blood is being shed. Bashar can’t carry on. But he can’t walk away either. He has blood on his hands. He is not in charge. Those around him are in charge. When he received Colin Powell a few years back (in May 2003), he promised him many things that were never implemented. The people around him wouldn’t let him. They told him: you are the president, but don’t take decisions and don’t make promises because you can’t see them through. The interview he gave Barbara Walters (last December) proves he controls nothing. Sarkis Naoum: Does his inner circle, especially its Alawites, support him? Some Alawite top brass might desert him. They could join the revolution if it takes them in. Or they could simply stay home, now that the uprising/revolution has taken a sectarian character. Maybe a significant proportion of Alawites don’t approve of Bashar’s policy. Some possibly hate him. But they cling on for fear of Sunnite factionalism, chiefly the Muslim Brothers and Salafists. Imagine that sectarianism has now engulfed Syrian expatriates in France. Medical staff at a French hospital included 13 Syrian doctors – 12 Sunnites and one Alawite. They were friends and worked together. Since the revolution, the 12 wouldn’t talk to the 13th. Here, in my country, the United States, resident Alawites are not invited to Syrian opposition meetings. The U.S. and the West have to find a solution to the Syrian crisis so as to spare Syrian blood and preempt Syria fragmenting. But that’s not their priority. They won’t intervene militarily. They could be supplying or allowing the supply of arms and funds (to the Syrian opposition). America was unequivocal when it urged Assad to stand down, ruling out dialogue with him. Had he been ready for a settlement in the first months of the crisis he could have saved his skin. Naoum: Does the Syrian regime still reach out to you? What does it ask of the United States? There is contact. He wants America to lay off his back. Is such a request plausible? Assad makes no sensible request and proposes nothing practical. Naoum: Is Assad Iran’s ally or its captive? He was Iran’s ally. He is now its captive. His father was an ally and a full partner (of Iran). He (Bashar) is a small partner. He can refuse Iran nothing because of its comprehensive cash, arms and training assistance. The Russians, who support his war on people seeking to oust him, neither ask him to step down nor facilitate his choice of compromise should he make one. The Syrian National Council (SNC) is not fully representative. Many of its members reside in the West. Some are in Turkey. Others are in Arab capitals. Some emigrated overseas a long time ago. Others were forced into exile lately. And they have differences of opinion on their role and eminence. The true representatives of the insurgent Syrian people are the Local Coordination Committees and the Free Syrian Army.